One of the main considerations for people investing in shares these days is the dividend income they will get from owning them. With a world of low interest rates on savings accounts and bonds and a change in the rules for taking pension income the choice of dividend-paying shares has arguably never been more important. Today, many people saving for retirement have no intention of handing their pension pot over to an insurance company in exchange for a guaranteed income for the rest of their life. Instead, they are taking control of their own money and using their SIPPs and ISAs to provide an income to live on. This has significant implications for investors following a dividend-investing strategy. By looking after their own retirement income they are effectively staying invested in dividend-paying shares for the rest of their lives. Not only do they have to generate enough money to live on, they have to try and make sure that their dividend income keeps up with the cost of living (inflation). This can cause a problem if you choose to invest in shares with a very high dividend yield. Your initial income from the share can be very good but it might not grow much and could even be cut. Investing in shares with a lower dividend yield but with faster dividend growth can actually leave you with more income in the long run. Reinvest your dividends into more shares and that income increases faster still with the power of compound interest. If you are ten years or more away from needing an income stream to live on then it might actually be better to pursue a strategy of investing in low- dividend-yielding shares with faster dividend growth potential than sticking your money in a slow-growing high-yielder. For example, a share with a low dividend yield of 1.5% growing its dividend by 15% per year for ten years means that your yield on initial cost will be over 6% in ten years’ time. So how do you go about finding the kind of shares that can deliver this kind of result? The obvious hunting ground is to look for shares that are growing their profits rapidly. This is not a bad idea but bear in mind you may have to pay rich valuations for many such companies. There is an alternative way. You can look for shares that are currently paying out a very low proportion of their current profits but are increasing their dividends by paying out a bigger chunk of them in the future. The dividend payout ratio is very simple ratio to calculate. It tells you the proportion of a company’s post-tax profits being paid in dividends. SharePad calculates this for you. Dividend payout ratio = DPS/EPS. In the case above, the dividend cover is two. One divided by two is of course one half or 50%. Below is a simple table of the equivalent dividend payout ratio for a given level of dividend cover. Why do some companies have low dividend payout ratios? There tend to be three main reasons. Firstly, the company wants to reinvest its profits in order to grow profits in the future. Providing the investment is earning an acceptable return on capital then this is a good use of company cash. Shareholders will usually be better off than if the company had paid the profits out as a dividend. This is not true for companies who spend their money badly and earn poor returns with it. The second reason is when the company’s profits don’t tend to be very stable and move up and down with an economic or industry cycle. In these circumstances the company wants to have a nice buffer of profits over the annual cost of the dividend so that it does not have to cut the dividend if profits fall in a recession. Lastly, the company may prefer to pay out its profits in a different way. Some companies prefer to buy back shares rather than pay higher dividends. Pub company JD Wetherspoon (LSE:JDW) has kept its annual dividend per share unchanged at 12p per share for many years whilst shrinking the number of shares in issue. 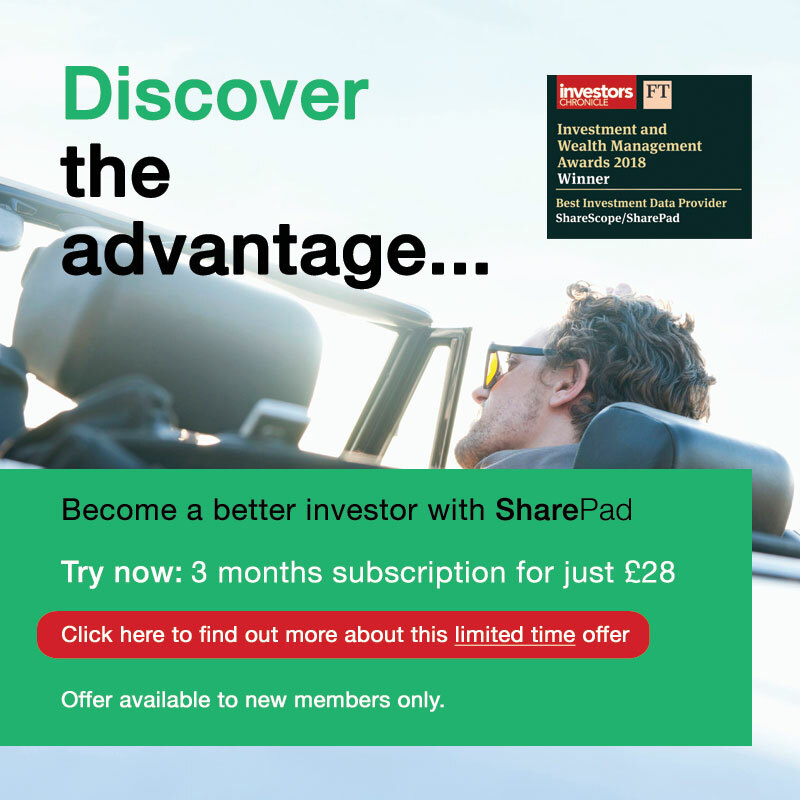 I’ve asked SharePad to look for shares where the rising payout ratio or falling dividend cover is contributing to high levels of annualised dividend per share growth over the next three years. Minimum forecast dividend yield of 1%. Minimum dividend cover of 3 times. 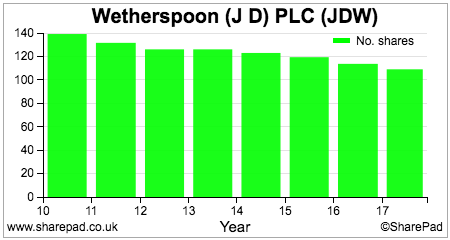 3 year forecast annualised dividend growth of at least 9% (3x the current rate of inflation). SharePad produced a list of 32 qualifying shares. I’ve listed 16 below with the most significant reductions in cover or rise in payouts. The key question with these shares is are they the kinds of share that can deliver the sustained levels of growth I was mentioning at the beginning of the article? With miners such as Glencore or banks such as Barclays, history suggests that this outcome might be unlikely. 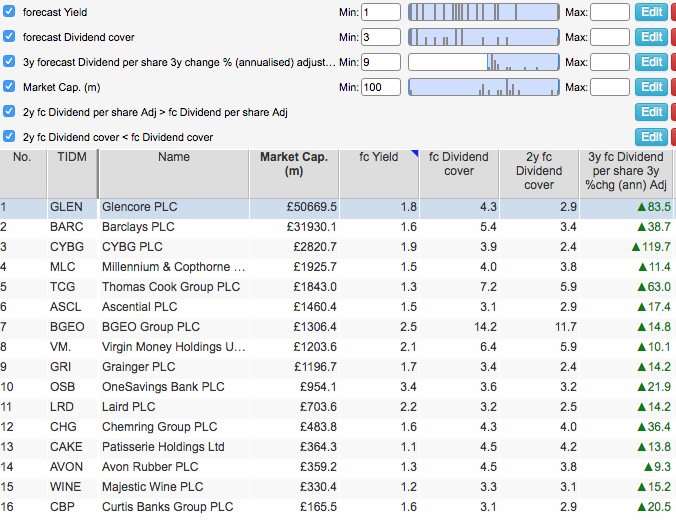 A couple of shares which might fit the bill though are Patisserie Holdings (LSE:CAKE) and Avon Rubber (LSE:AVON). Patisserie Holdings is so far proving to be a very successful retail roll out story with a growing number of posh cake shops or concessions. Business is good as evidenced by its recent results. This is a business with growing profits and a low dividend payout ratio. Once the business matures, the scope to hike the cash payout is considerable which could see long-term investors build up a significant annual income from owning this share. 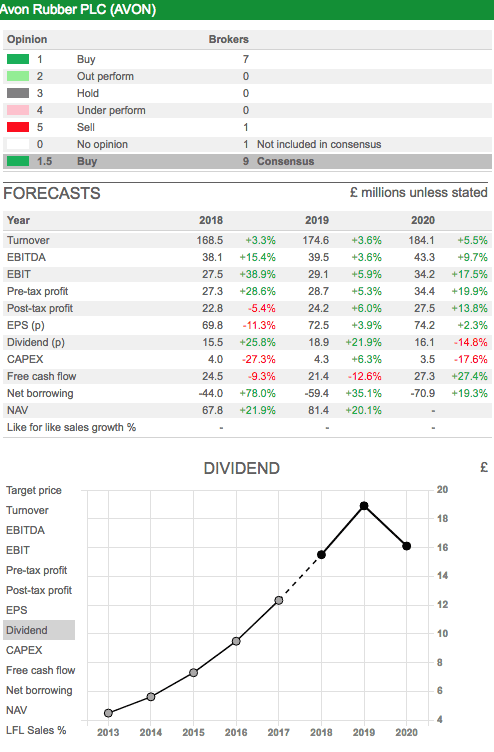 A payout ratio of 50% – not unreasonable for this kind of business – on 2020 EPS forecast of 21.8p would equate to a dividend yield of 3% on the current share price of 364p with prospect of more dividend growth in future years. Analysts’ forecasts for dividends in 2020 look too low to me and will surely be revised upwards. 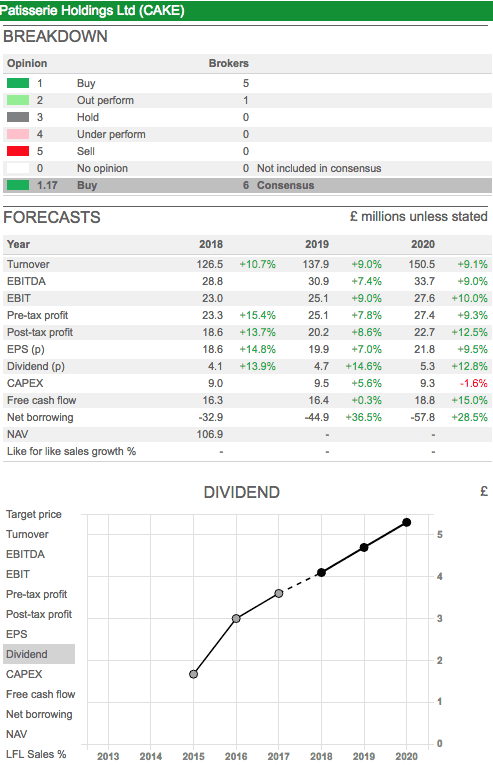 If Avon meets its current 2020 EPS forecast of 74.2p a dividend that is twice covered would be 37.1p which would equate to a dividend yield of 3.2% on the current share price of 1150 compared with current forecast yield of 1.1%.